St.Lucians can experience, the first ever, ULTRA VIP Invitation Only Carnival Band, in 2008. The 2008 theme is Atlantis The Lost City: Over 11,000 years ago there existed a land in the middle of the Atlantic ocean populated by a noble people and powerful race. 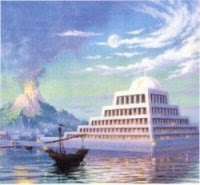 This was the island of Atlantis. Atlantis was the domain of Poseidon, God of the sea. When Poseidon fell in love with a mortal woman, Cleito, he created a dwelling at the top of a hill near the middle of the island and surrounded the dwelling with rings of water and land to protect her. For generations the Atlanteans lived simple, virtuous lives. But slowly they began to change. Greed and power began to corrupt them. When Zeus saw the immortality of the Atlanteans he gathered the other Gods to determine a suitable punishment, Soon in one violent surge it was gone!! The island of Atlantis, its people, and its memory were swallowed by the sea. Costume sections display, package pricing and more information SOON TO COME!